It took just one Christmas message tweet by Femi Adesina, President Buhari’s special adviser on Media and Publicity, to re-ignite what has been a brewing online war between the so-called “Jonathanians” or the latter day, “wailing wailers” and the “Buharists”, a band of combative, fiercely loyal post-2015 election supporters and defenders of the President. For those new to the ongoing “roforofo” fight, perhaps an introduction will suffice. Former President Goodluck Jonathan, (the most criticised president in the world, in his own words) had in sympathy, gathered a crowd of virtual and street sympathisers who had coalesced under the name “Jonathanians”. 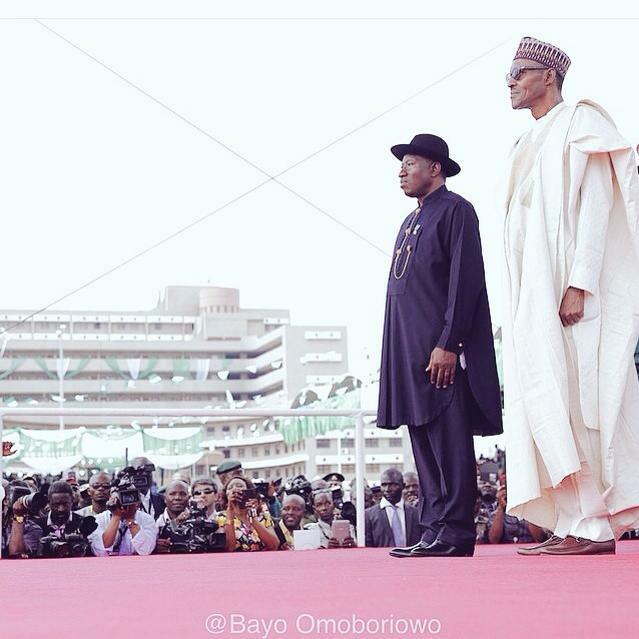 For them, Jonathan was the best president Nigeria ever had. They became aggrieved after his defeat and were quickly labelled the “wailing wailers” by the “Buharists” who still taunt them for being sore losers. The battle line had been drawn. The online brawl between the “Jonathanians”, which also include former appointees of his government aggrieved that their “yam” had been rudely taken from them, have since been engaging in a seemingly open fight with the Buharists on social media. Observing the altercation, one gets the impression that the Jonathanians still feel hurt by his electoral defeat and strangely want him back for obvious reasons! Then enter Adesina on Chrstmas Day. The special adviser had to rouse a sleeping dog with one mocking tweet targeted at the Jonathanians. The tweet was like a single rocket fire launched at the enemy in a warfront. Expectedly, the “Jonathanians” returned fire. The ongoing social media war is another type of war. It is not your traditional type of war. There are no physical weapons. The guns are not booming and you won’t see casualties or bodies piling up as you would in a conventional war. Nobody is taken prisoner. While the war may not be physical, and the victims not be carrying physical scars, its effect is more deadly on the nation. The impact of this war on our nation may take a long time to heal. By the time the protagonists are done, they may end up dragging the country down the path of perdition. Now, with this war, relationships that have taken years to build are being sacrificed on the altar of partisan bickering. The aftermath is capable of setting the country on fire. Over the years, the country has been driven to the edge many times. We have come to the brink of disintegration when our fault lines are used to cause to mass hysteria which is what is happening on social media. How long will take for the fight to spill to the streets? In cases when our differences have led to violence, they have always been fuelled by hysteria. For example, an image of a large scale massacre of an ethnic group mischievously posted on social media can lead to actual reprisal of innocent people. That is the power of social media. We have come to that many times. On social media, Nigerian youths are the foot soldiers of this ongoing war. They are the social media warriors of politicians. Sometimes, one wonders where the loyalty should lie. Should the loyalty be with politicians or with country? Sadly, on social media war, their loyalty is with the politicians. Rather than demonstrate loyalty to Nigeria, they queue behind politicians to hurl insults at one another. They dredge up old grudges that have kept us from achieving unity. What is happening on social media is at best disgusting. There is so much hate and divisive rhetoric actively promoted by these social media warriors. And to think these are the youths who will soon get into leadership positions. Now all it takes is for one to have a social media account or hide behind the anonymity of comment platforms to launch some of the vilest hate speeches on fellow citizens. The amount of hate being peddled on social media is enough to destabilise a country and cause war. The fight on social media if taken to the streets will wreak enough havoc that will make the genocide in Rwanda seem like a child’s play in Nigeria. The proxy war is fought in support of Nigerian political gladiators. It is an epic battle that I pray will not define the future of Nigeria. The future of Nigeria is doomed with these youths who engage in hate speeches on social media just because they find themselves as errand boys of politicians. During the widespread protests occasioned by the continued detention of Nnamdi Kanu, the leader of Indigenous People of Biafra, a leading social media “activist”, was accused of posting an image on his Twitter account that depicted Hausa people allegedly being attacked by some pro-Biafran protesters in Port Harcourt. It was later found to be a hoax and a deliberate attempt to escalate the protest. Now, that deliberate mischief could have led to a massacre of the Igbo in the north. The toxic nature of our politics has found its way into social media. Nigeria is so divided today than it was years ago. You can feel the pulse of division on social media. On social media, wild allegations against individuals and groups will often go viral than the good news of a maternity home being inaugurated in a remote village. Social media pages are being created by foot soldiers on both sides of the divide to peddle falsehood. Lies are deliberately fabricated to set up one ethnic group against the other or to spread unsubstantial allegations against. Again, I ask, when did our country come to this? Prior to the emergence of President Jonathan following the death of President Umaru Yar’Adua died, there was a common front as Jonathan was actively supported by Nigerians to succeed Yar’Adua. Even in 2011, Nigerians still voted massively for him for a fresh term. Now at what point the Jonathanians began to claim ownership of the former president is what beats the imagination. Even now that he is long gone, they long for his return to power. The same goes for the Buharists; they are ready to the dig deeper into their trenches to fight anyone who criticises Buhari as if the President can do no wrong. With all sense of modesty, I was one of those who wrote against the incompetence of the Jonathan government. Like all Nigerians, we welcome the change Buhari represents when he sought to lead us. But the loyalty to his candidacy should end there. Just as all lovers of Nigeria criticised Jonathan when his campaign slogan of a ‘breath of fresh air’ became business as usual in his six-year reign, our loyalty should be with Nigeria and not individuals. For the Jonathanians, pulling Nigeria down because they don’t like Buhari is cutting one’s nose to spite one’s face. For the Buharists’, the President is not beyond criticism. No human being is. Blind loyalty to a leader is destructive. Nigeria is greater than any individual. The insanity on social media must be tempered with reason.